Houstons award winning tattoo studios featuring 16 artists Owned and operated by Johnny Jackson keeping his standards high in the community and industry, personally involved on a daily basis to ensure the name remains synonomous with excellence. Located in Northwest Houston off Jones Road 281-894-2282 and our secong location at 5930 Hwy 6 North 281-463-3302 Offering Body piercing and tattooing in state certified and licensed studio for over 15 years. 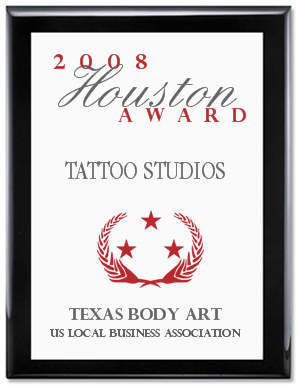 WASHINGTON D.C., October 31, 2008 -- Texas Body Art has been selected for the 2008 Houston Award in the Tattoo Studios category by the U.S. Local Business Association (USLBA). Texas Body Art pushes the limits in Houston!!! Texas Body Art and Johnny Jackson 2012. Picture Window theme. Theme images by Petrovich9. Powered by Blogger.